MR Online | The Blockade: what happens if it continues? Posted Jun 15, 2018 by Eds. The following article was published shortly after the VIII Summit of the Americas, in which US-led international forces attempted to side-line Venezuela, who had not been invited, and use the summit to push for harsher measures against the country. 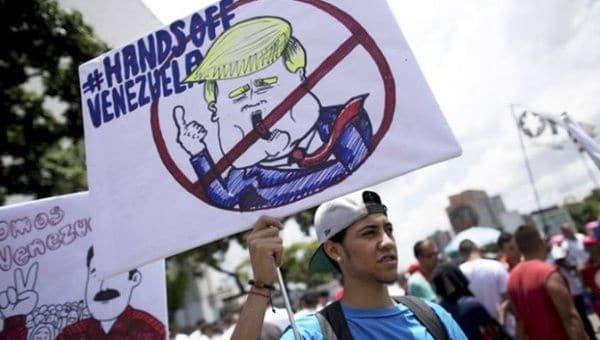 Since then, Washington and its allies have only ramped up pressure on Caracas, with the Trump administration imposing a second round of economic sanctions following Nicolas Maduro’s May 20 re-election triumph. The article analyses the implications of the tightening sanctions vice-grip. Despite the fact that the Summit of the Americas was a failure both for its organisers and the expectations of the criminal Venezuelan opposition, which uses extortion to seek non-democratic paths for Venezuela by calling for the strengthening of the commercial and financial blockade and fantasizing about a foreign invasion, it is no less true that this aforementioned blockade has not only been maintained but does not need the approval of the summit to worsen. As such, and following Panama’s recent declarations, other countries of the region and the world have proposed following suit and announcing unilateral measures against Venezuela with the excuse of defending democracy. So we can see that in this order of ideas the announcements from countries like Argentina and Switzerland have helped harden the sanctions which were directly promoted by the U.S. Treasury or which are a result of their actions. Recently, an Iranian banker was detained in the U.S. accused of evading the coercive measures of the U.S. Treasury. Equally, Nicaragua, a country which is politically allied to Venezuela, has “cooled down” its sales to Venezuela, which despite not being an official measure of the Ortega government but rather of the private business groupings, has not been clearly denounced by [the leftist Central American president] either. From the Colombian side of things, it has been very evident for some time that this government has joined the blockade without having formally declared so. This has even been denounced by the Venezuelan government, despite the fact that it continues the unexplainable policy of buying products from Colombia, some of which never arrive, arrive late, and/or are authorised when they are no longer necessary (including, in the case of food products, when they have gone bad). The government of Brazil for its part has made ambiguous declarations regarding the topic, but we know very well that it is just one more of the enthusiastic current enemies of our country. To all of this we must add the question of the Petro. As you will remember, this “cryptocurrency” was announced as a shortcut to evade the blockade, hedging bets on the “democratic” essence of the world of cryptocurrencies which supposedly escape the control of the conventional world financial system and, as a last resort, are an alternative to the “hegemony” of the U.S. dollar. We have repeatedly warned that such conclusions may commit the sin of being naive. This is because despite moments which show them to be true, they suppose some static global powers which simply sit aside and watch as they are evaded by “non-traditional” routes which arise “through the pores of the system,” as one apologist of cryptocurrencies has said. The counter position – as is well known – is that the U.S. Treasury has approved unilateral measures against operations in Petros, which formally only applies to U.S. residents but in practice reaches across the planet. Is the Petro really a sufficient alternative? Due to this problem, some have suggested that to escape [US sanctions] it will suffice to develop some sort of alternative “ecosystem” of digital exchange between our country and the different businesses which are happy to trade in Petros. Nevertheless, we believe that this is also naïve for at least two reasons. The first and most obvious is that it continues to underestimate the reach and possibility of extortion by the bodies of global power. In practice, every person, business, or country with commercial interests in the USA or any of its allies which join the campaign, who have accounts in any U.S. banks, use perfectly traceable U.S. financial instruments or internet servers can be watched and may be subject to sanctions, which is something they must think about when they come to deal with or lend to Venezuela. This is what happened to Bitfinex, the largest digital exchange platform for Bitcoins which is based in Hong Kong, who has now announced that they will not trade in Petros so as not to expose themselves to sanctions from the U.S. government. But let’s suppose that this last point is made possible, the problem with this argument is that it still touches only the surface of the problem. It supposes that as the blockade is commercial and financial, then it can be solved by offering economic agents certain “alternate” mechanisms to trade with Venezuela behind the backs of the U.S. and the U.S. treasury. This is a crass error as it ignores the nature and origin of the economic agents and the implied type of trade which our country currently depends on. In summary: the Petro may be necessary but it is far from enough. The level to which the current commercial-financial blockade against our country affects us does not depend on the hegemony of the dollar nor on the use or not of the traditional financial system. These two elements, whilst being very important, are not those which determine affairs. The determining factor is the politically-dependent nature of Venezuelan foreign trade with countries which are currently hostile to us. As such, the blockade, apart from affecting the mechanisms of payment, deep down affects the internal dependant productive-economic network. In relation to this, we can see the following two images taken from the Atlas of World Economic Complexity from Harvard University. The Atlas brings together world figures and the nature of trade between countries, allowing us to see a very complete picture case by case. 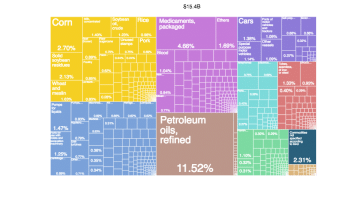 We would have preferred to have used official Venezuelan data, but as it is not being published this is impossible, hence why we chose to use these sources. 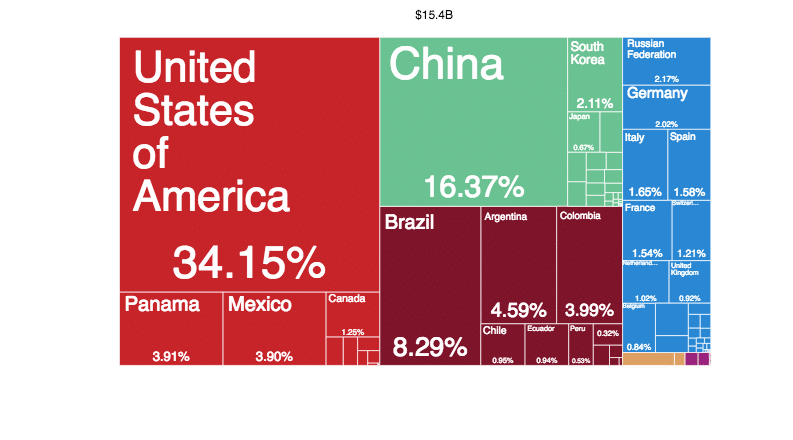 If we focus on the first five imported goods we already have an important approximation of the magnitude of the problem: firstly we have a system of imports not just of food but of raw materials for the processing of food, which monopolises a significantly large percentage of total imports. In second place are the materials and resins necessary in industrial processing in the country. In third place, medicine and materials for the local production of medicine. In fourth place, products derived from oil. In fifth place, parts and vehicle parts. In all of these goods it is worth noting that the control and concentration by (mostly U.S. based) transnational corporations is notorious. It is also worth noting that they are sectors which have especially been hit by the effects of the blockade. 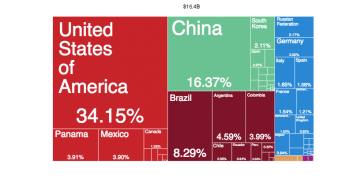 With the exception of the case of China (the great commercial and geoeconomic achievement of President Chavez), what this image shows is that when it comes to our imports, we are not only dependent on transnationals but on hostile countries. In fact, of the first five in the ranking, three belong to the so-called Lima Group, plus the hostile USA. Equally, of the first 20, at least 17 have joined actions of blockade or harassment against our country. As another curious figure, we can see that the level of imports coming from Colombia is much less than what is normally thought. This we mention because one of the arguments strategically used by those who oppose the application of hard-handed commercial and border measures against the hostile neighbouring country is that this will affect the flow of imports and cause shortages. The figures on offer do not back this reasoning up. It is naive to think that the blockade is strictly an issue of financial commerce. As important as the issue of payments and payment methods may be, deep down it is a problem of our productive-commercial system which is mostly dependent on transnationals and countries whose governments are in their majority hostile. Should this situation continue, despite alternative payment channels which we invent and come upon, the local productive apparatus (and thus the country) will continue to grind to a halt, including the heavy transport fleets, commuter buses, and even private vehicles which currently face severe shortages and price speculation in repair parts. Despite circumstantial measures which may help to ease this current picture, the sustainability of the Bolivarian Revolution must include a radical change in the import-productive network, which is not only an economic problem but a cultural one also. This supposes two important elements: the substitution of key imports of both finished products as well as of capital-based goods and raw materials for national production, and changing the origins of our imports which can’t be substituted to allied countries such as China or Russia. However, these two things, especially the second, suppose a restructuration of the local productive apparatus and of the patterns of internal consumption. With the current oligopolies and monopolies this is virtually impossible to do. As much as it is not a structural solution, we believe that the Venezuelan government should transcend the current policies of denouncing the blockade and its effects through press statements. As such, we think that they should take as a reference point the Argentinian conflict with the vulture funds during the government of Cristina Fernandez which she transformed into a world cause in the heart of the UN. Recently, in fact, a UN representative recommended something similar. One could counter-argue that there are no guarantees that anything will be solved via this path, which is certain, especially given the character of an organism like the UN and the multilateral bodies in general. However, there are greater chances of achieving something than by just publishing press statements that are quickly forgotten in the daily informational whirlwind. Luis Salas is a Venezuelan economist, ex-professor in the Bolivarian University of Venezuela, and served briefly as vice-president of productive economy.